This photogenic salon lies within a Georgian townhouse that's both Grade II-listed and the only original building left on Great Queen Street. Behind its handsome exterior is an airy, stylish space, offering hair and beauty treatments (the latter including manicures, waxing and the like), as well as an academy for aspiring hairdressers, over four floors. Ena has an eco-friendly philosophy – something that's reflected in everything from its tastefully upcycled decor to its use of sumptuous organic hair and beauty brands. A cut, colour and blowdry (from £59 – Ed’s note: from £67 as of June 2018) was handled by the expert team with flair – they left my straggly mop looking sleek and healthy, and smelling amazing (thanks to deliciously-scented Davines products, of which this place is the flagship stockist). Despite its vast size – and proximity to a rather grey, corporate patch of Holborn – the salon has a cosy, neighbourhood-y vibe. I was offered homemade cookies baked by one of the styling team on my visit, and staff were relaxed and friendly. A very welcome retreat from the hustle and bustle of the city outside. Effortlessly elegant, Ena Salon Hair and Beauty is nestled in the heart of Covent Garden. Situated in a sprawling Georgian townhouse, luxury and sustainability seamlessly combine neutral, clean living luxury with an opulent approach to up-cycling. Simon's been cutting my hair for over a year now. He's a really cool guy who's great at what he does. Ena Salon is very stylish, relaxed and friendly. They have a great way of having a lot of customers yet not feeling hectic and noisy like a lot of salons. After getting a voucher for here for my birthday, I booked for a colour and cut. Ash gave a great consultation and really listened to what I wanted. Dammy did a great job with the colour in my hair and was so attentive and friendly throughout my trip. She kept checking the colour to ensure I got exactly what I wanted and I've had so many compliments since. Ash did the cut and a great blow dry with all the volume that I wanted! Overall, I can't wait to go back. The tips they gave me were really helpful and I felt like a queen. The salon has a lively and exciting buzz that makes for a welcoming and warm atmosphere. Thanks so much! My first visit to Ena this weekend was wonderful. Dammy spent so much time listening to exactly what I wanted and gave me a great balayage and finished my hair off with beautiful pink tones. The atmosphere in the salon is great and everyone is so friendly. If you want to be pampered, it is definitely the place to be! Fantastic place, lovely atmosphere, quality hairdressers - highly recommend it! I really want to leave an amazing review in regards if one of your employee, Andrea!! Unfortunately I got white hair and I disperately needed a full coverage color, plus a stylish cut. Andrea actually made all this possible!! The color was perfect and absolutely stunning I couldn’t ask for anything better! Since then Elsa saloon became my N.1 hairdresser. In fact, when I am in London, I am always try to get an appointment and, of course, Andrea will be my preferred and super professional hair stylist!! I had a very nice time at Ena Salon, Gianna was wonderful, super friendly, she really listened to all my anxieties and took the time to explain how to style my new haircut. I went from very very long hair to shoulder length hair and I couldn't be happier. I left with a big smile on my face, lighter hair and a bag full of goodies. Thank you again! Loved my first experience of Ena Salon, Dammy looked after me from the minute they fitted me in without an appointment! I will definitely be back, all the staff were great, friendly and genuinely happy to be there. It was my first visit to Ena and i wasnt disapointed, the place has a very nice vibe. I had my hair cut by the lovely Gianna, she took the time to discuss my hair and then showed and gave me tips on how to style and maintain it. I knew i was in a safe pair of hands. With Gianna coming from a long line of hairdressers she offers an inherent breadth of knowledge and experience and a natural eye for hairdressing. She turned my tired look into something full of shape and body. I will certainly be returning for my next haircut and one of those delightful baked goods again! Ena Salon is an absolutely standout salon - from the service to the finished product, I couldn't have been more pleased. I would recommend Ash to anyone looking for a talented and personable stylist that really cares about your 'do! Had a lovely experience at Ena Salon!! Excellent service as staff was really friendly and professional! Excellent products used and loved my haircut by Gianna, she is extremely talented!! Definitely recommend Ena Salon to new comers! Great service from start to finish and Gianna really is wonderful! Had my first appointment yesterday and absolutely loved it! Gianna was lovely and I am definitely going back! It's always a pleasure to see Tommy and it's a bonus I come out with a great cut and which grows out so nicely. He always listen's to my suggestion and provides advice and suggestions which are always great. I highly recommend! The salon itself is beautiful full of natural wood, all the staff are all really friendly creating a nice environment. The products they use (Davines) are really good and also cruelty free and vegan. I had my first appointment at Ena Salon last week and had my hair cut by Gianna and it was a great experience. The salon is beautiful and the team is really nice and welcoming. (There was an amazing cake too!). Gianna is amazing. She took good care of my hair, she listened carefully to what happened to my hair. She gave my loads of suggestions and advices and she manage to sort everything out! She’s truly fantastic and I’m really happy with my hair now. I had my hair cut by Gianna last night and it was a thoroughly enjoyable experience! She listened to what I said as well as offering other suggestions on what we should do. It's a great haircut and I had a lovely time at the salon. Everyone was so welcoming and it was very relaxing. I'll be back in a few weeks for colour! Beautiful salon and lovely staff. Definitely somewhere you can go for a haircut and enjoy the experience. They also hold a stunning product line. I highly recommend this place! I have been doing my hair at Ena for two years. The salon is clean and charming. The best are the friendly staff, specially Ana from Barcelona all the time she has been very professional and nice and the lovely Tammy always helpful. Salon was a wonderful place to spend 5 hours getting a cut, colour and blow dry. Decor is pretty, it’s super clean and the staff offer you plenty of refreshments. Ash was 10/10, very friendly and thorough. My friends all commented on how perfectly sharp the cut was! She did a really good job of making the colour look natural and exactly how I had imagined. Well worth the money, I will definitely return! The salon is beautiful. Frazer is absolutely amazing and I would never let anyone else touch my hair! The entire team and so friendly and helpful - Definitely reccomend! Gorgeous atmosphere, lovely treatment and a superb haircut. Can't rate them highly enough. Love my lovely Pedro’s haircut! I had my first haircut yesterday&i am blown away by this team. it feels like entering a big families house, where everyone looks out for eachother with care, love and respect; a rare thing to experiance in todays world. i felt welcome and taken care of, while getting a perfect haircut. merci. oh and my favorite thing was the ceiling while getting my hair washed. Sorry for the late review... I had my first appointment at Ena Salon about 2 weeks ago. I had a pleasing experience since my arrival. Everyone was friendly and I felt very comfortable. Had a haircut with Gianna who was amazing from the beginning to the end. She explained every step pf my haircut and gave me tips on how to style my hair at home. Definitely having my next haircut with her again. THanks Gianna! Hugs from Agatha. I had my first appointment at Ena salon this weekend and it was such a delight. The place is beautiful and warm and the people are so welcoming. I must say the hairdresser that I had booked my appointment with did a lot to the great experience. I usually don't like going to the hairdresser as I feel that it is hard to explain what you'd like and it often results in something you're disappointed with but here Serena was so nice and sweet and actually listened to what I wanted or didn't want. She gave me great tips, took all the time (and I feel even more) that she had and offered samples of shampoo and conditioner. I am definitely going back! I had the most terrible colouring experience here, which I have to share as it upset me so much. The woman left the colour on for much, much longer than she had originally said. I know, since I was timing it on my phone. However, when I tried to alert someone, they said I had gotten it wrong. When they finally agreed to wash it off, my hair was almost black (I had wanted light chestnut brown) and felt like straw. My scalp was burning. I tried to tell them I was unhappy but the woman who had coloured my hair seemed to have disappeared and the woman who washed my hair didn't really care too much. I emailed them afterwards and nobody ever got back to me. Yes, the salon looks nice and has a good vibe but I would never, ever recommend it in case this happens to somebody else. Wonderful experience and my hair looks amazing and smells lovely. This is not just an ordinary hairdressing salon. They make you feel special and cared for in all moments. Gianna is just so sweet and so professional. I enjoyed that she and Ursula explained everything in detail, and gave me fantastic tips. The products they use are all cruelty free and vegan (Davines, an Italian brand), and the atmosphere of the salon is homey and stylish. I very much look forward to go back soon. It's hard to express how much I enjoyed my first visit to Ena Salon. Gianna was truly amazing: no hairdresser has ever thought so carefully and cleverly about what style would suit me, and I've never found one who was so considerate, warm and kind. She's given me a really lovely new style, and I felt involved in the whole process (even down to the very clear explanations of how to blow-dry it straight or natural, which I've been able to follow easily since). I'm absolutely delighted that I found this place. The staff are extremely friendly, and I love the salon's style (especially its sustainable ethos, and the eco-friendly and vegan products - including hair colour, which is a tall order. ) The beautiful ceiling above the washbasins is a great touch, as is all the recycled/reclaimed wood and furniture. What a wonderful find! A wonderful first visit - all of the team are slick and professional (and really friendly!) The salon itself is beautiful, and it makes you feel as though you are in a cafe catching up with friends - thanks in large part to the wonderful homemade cake on offer. Ana did a wonderful job on my hair - my dry and damaged (and badly coloured, thanks to my last salon) now looks and feels incredible. She listened to what I wanted and outperformed. I usually don't like visiting the hairdressers, but I can't wait to see Ana on my next visit to Ena! What a perfect experience for my first visit. I can't wait to come back. Ash was so understanding and helpful and recommended a special treatment which left my hair looking and feeling amazing. I had the pleasure of going here yesterday, I wasn't sure what to expect because, having curly hair, not many places I've been to before know what to do with it. I admit I was sceptical at first but that all went away as soon as I met my hairdresser. She was absolutely lovely and really cared about what I wanted and how I felt about my look which gave me confidence. The treatment I received was of the highest quality and care and they even kept up with my irritating tendency to ask for coffee and forget where I put it. I've had a wave of compliments since getting my hair done and it suits my personality perfectly. I will definitely be going again next time. Thank you to Serena for her excellence! I went to Ena for a treatment, cut and blow dry, and was really happy with the outcome! I wasn't sure of what to expect as I have quite dry and curly hair. Firstly, the hair wash and scalp massage were phenomenal! For the cut I had booked with Iveta, a young stylist in the Covent Garden branch and...WOW...what a fantastic cut and finish, not to mention great customer service. In fact, the whole team were lovely and that made for a really enjoyable experience all around. Can't recommend them highly enough! I bought a package of 3 haircut & blow dry through an work mail offer. I wasn't sure what to expect.I had my first visit this week, and I had the colour done as well. Absolutely amazing! The entire experience. It makes you feel that you are in a cafe catching up with a friend. Great place, nice staff and I'm really happy with my haircut. Ohh, i forgot to mention about the head massage! To die for! And the complimentary homemade cookies ! Brill! I can't wait to go again. Many thanks Ena salon. Monica ( who love Greece). 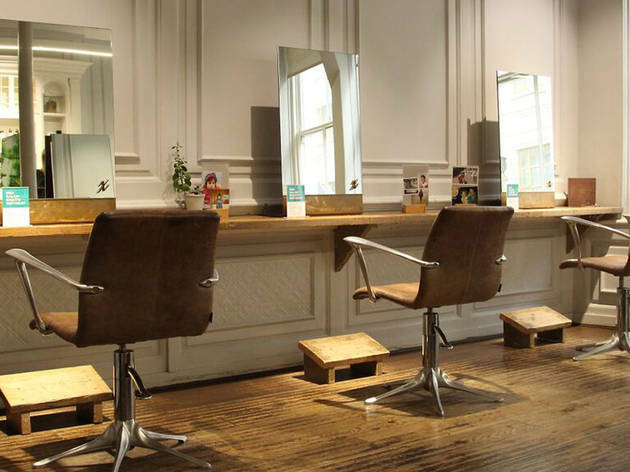 A lovely salon moments from the heart of Covent Garden. 99% of the time I leave a salon feeling unhappy with my cut for at least a few weeks until it mellows. That was not the case here and my hair feels happy and thick! I had a lovely experience from the moment I walked through the door. Friendly staff, a good hairdresser who did what I asked (I always ask for a boring cut), plus nice products. I particularly liked the painted ceiling above the hair washing stations, nice to have something to look at. Amazing salon! Very welcoming, and beautiful surroundings. Offered a selection of drinks (including wine) and homemade biscuits. Had a great head massage when hair was being washed, and Gianna who cut my hair was lovely and really listened to what I wanted, as well as spending a while doing the perfect blow dry. Sent me home with some free samples. Will definitely be back! 10/10 service, lovely staff, AMAZING head massage, great surroundings. Best salon I've been to in my 4 years in London. The best salon I've been to. The salon itself is so nice and relaxing to be in. Really easy online booking system where you could pick your stylist (so as to know the price you'll be paying). My stylist was lovely and the girl washing my hair did a great head massage. Offered a glass of wine and homemade treats! Everyone was friendly and I left with samples of the amazing natural cruelty free hair products they used on me in the salon. Already booked my next appointment! A wonderful experience! The salon is a beautiful environment, the staff are all very welcoming and friendly and the service was impeccable. Francesca was an absolute delight and did the best job. I cannot recommend her (or the salon!) enough. I loved it! Ash made a miracle with my hair, which I am growing from bleach white mass to natural darker blond. A lovely experience from when you first wall in friendly staff and made to feel relaxed offered amazing cake ! Will definitely go back . Loved it, was a friendly welcome and what impressed me was the lovely person who washed my hair introduced herself which I've never had before, thank you for the gorgeous head massage. My cut is the best I've had in a long time, cheers J. A wonderful relaxed afternoon. Loved it, I only got a blow dry but it was the best salon I've ever been to. The best salon I have been to in London, the whole experience from start to finish is amazing. Will be going here from now on! Ena is the most beautiful salon with the warmest of receptions. All of the staff are extremely attentive and friendly. Ana is a lovely stylist who really listened to what I hoped my new style would be and advised the best way to suit me. It was such a lovely experience and I was much happier with my hair than I thought I would be. I'm looking forward to returning for some of the davines treatments as well as becoming a regular client of the salon. Thank you for a refreshing morning!